#05 May 2017 – The Book Hive, Norwich - Dog Ear - it's a bookmark. It's a magazine. It's free. This month’s professional bookworm is Henry Layte of The Book Hive. Originally a man of the theatre, it wasn’t until he did a bit of part-time work in the National Theatre bookshop that the bookselling bug bit him. 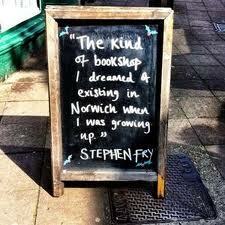 Seven years ago, he took a (big) punt and opened an independent bookshop in Norwich. Now a favourite of Stephen Fry, his quirky, stylish shop is a must-visit attraction in the Fine City. A beautiful three storey building bursting with personally chosen, intriguing titles, the Book Hive has deservedly won loads of awards. It’s also regularly in the press – sometimes resisting the mindless corporate antics of Coca Cola, sometimes entering high-profile debates about bookshops, politics and free speech. True to Henry’s innovative and irrepressible nature, the shop has birthed two publishing imprints (Galley Beggar Press and Propolis), discovered hugely successful books, and launched an unbeatable subscription service. For more Book Hive brilliance, get on their mailing list or connect on Facebook. ‘Hamlet’ by William Shakespeare: I read this for my A levels when I knew I was either going to be a musician or an actor. It has remained as piercingly brilliant a look at male teenage angst and confusion as anything I’ve read. As a teenager reading it I was probably pretentious enough to think it was all about me, but as an adult I find it endlessly amazing that so much of what he wrote speaks so clearly to so many now. ‘A Girl Is A Half-Formed Thing’ by Eimear McBride: Perhaps it’s a bit obvious to choose this, but it means a great deal to me. When I first read the manuscript for this on holiday in France, I was deeply troubled. Why had Eimear offered this to me to publish? Why had no one else taken it up? Could I trust my own instincts at all anymore, or was I getting this totally wrong – was it unpublishable, as many people had said before? Turned out I was right – it IS quite good! ‘The Disappearance of Adele Bedeau’ by Graeme Macrae Burnet: I recently read this – his previous novel before the Booker listed ‘His Bloody Project’. It’s a wonderful, elegant book, reminiscent of the best of Georges Simenon – a quiet, heavy with atmosphere and hugely engaging crime story, set in small town France. ‘The Perfect Stranger’ by P J Kavanagh: This is a bit of a cheat, because it’s not strictly contemporary – it came out in 2015 – and it’s not broadly contemporary either – it’s a reissue of a 1966 book. But the reissue is what brought it to my attention, as well as many other current readers I hope… so I think it fits! This is a memoir which ticks all the boxes of what great books in that genre do; it allows you access not only into the mind and life of another person, but a whole other world, despite being one which is closely linked to today, in that it is set recently in a recognisable world. It is funny, enlightening, and beautifully, beautifully written. Because one knows from the outset that the end is sad, one is prepared for it, which adds a note of melancholy throughout the proceedings. However, this sadness does not mean that the author’s life ended in that vein, because – and here is the most startling fact – it is a memoir written by a man in his thirties who went on to live a long, full and productive life after the last heart-breaking chapter of this book. Utterly inspiring. ‘Lincoln In The Bardo’ by George Sanders: He came to Norwich recently to do an event and I was invited to take part, acting out a character in the reading. I was standing on stage with him and the great comedy writer Graham Linehan, reading these wonderful words and thinking what a bizarre situation to find myself in… but how utterly brilliant. It was so fascinating, and he spoke so well, that it became the next book on my reading pile straight away.